Kadima faction holding a press conference at 5:00 p.m., Mofaz expected to say he's leaving government. The Kadima Knesset faction has announced it is holding a special press conference at 5:00 p.m. Tuesday. 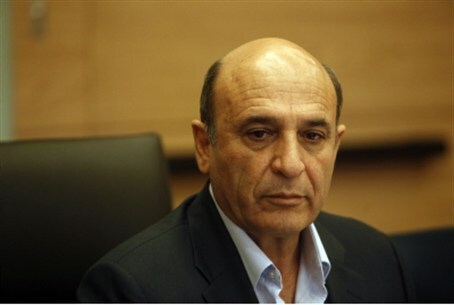 Party chairman Shaul Mofaz is expected to announce he will leave the coalition after failing to reach an agreement with Likud and other coalition members on the matter of hareidi enlistment to the military. Prime Minister Binyamin Netanyahu said in a Likud faction meeting Monday that he is committed to a more egalitarian division of the burden of military service, and that he is working with Mofaz on an agreed solution. Netanyahu said the two sides had agreed on many subjects, including personal sanctions against draft evaders, and that he hoped the remaining differences could be bridged "within the next few days." MK Nachman Shai of Kadima told Channel 2 News that he believes the faction will split in two, even if a last minute agreement is reached between Mofaz and Netanyahu. Part of the party will remain in the coalition and part will move to the opposition, he estimated. If Kadima does split, and if a sizeable number of its MKs remain in the coalition, the nine-week romance between Likud and Kadima may be judged as a victory for Netanyahu. By letting Kadima into his coalition and then refusing to give it what it demanded regarding hareidi enlistment, he will have split Kadima in two, while enlarging his coalition and making Likud the largest faction in the Knesset. Kadima currently has 28 seats, one more than Likud. A split in Kadima would probably leave Netanyahu with a stable government and a chastized, fractured opposition, freeing the leadership's energies for a possibe attack on Iran's nuclear facilities as the fall season approaches.